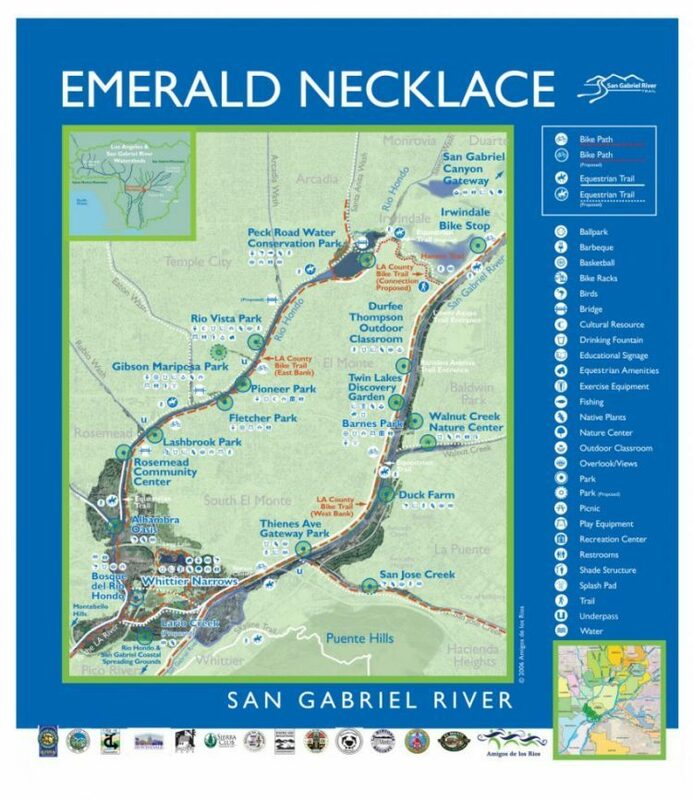 What is the Emerald Necklace? The Emerald Necklace is an interconnected loop of parks and greenways along our urban waterways. Nestled in the heart of the San Gabriel Valley and extending from the San Gabriel Mountains to the Angeles National Forest down to the Pacific Ocean, providing desperately needed recreational areas. An important part of our mission is working with other organizations to make the Los Angeles region into a recognized leader in park and green space creation opportunities working to offset the effects of climate change. In 2005, Amigos de los Rios introduced the initial Emerald Necklace Vision Plan that outlined a detailed strategy for the development of a 17-mile loop of beautiful multi-benefit parks and green-ways connecting 10 cities and nearly 500,000 residents along the Rio Hondo and San Gabriel rivers watershed areas of East Los Angeles County. Over the past 15 years, we have been working as a liaison between the community and public agencies to facilitate the collaborative effort known as the Emerald Necklace Expanded Vision Plan. In 2008 the vision was Expanded.. The expanded plan outlines eight regional goals including promoting active transportation such as walking and biking; designing and building communities that are resilient to the current and projected impacts of climate change, and fostering a strong green economy. 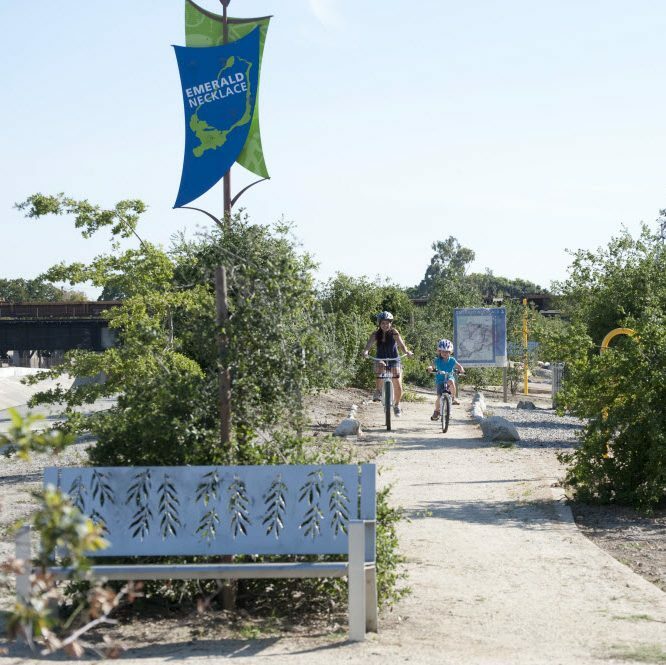 The Emerald Necklace Expanded Vision plan was completed in 2014 with the assistance of The Conservation Fund. The Emerald Necklace Regional Park Network in Southern California has the potential to become a world-class park network on the scale of Central Park in New York and will be a significant piece of the vision for an urban Los Angeles connected by river green-ways. Our vision plan was inspired by a portable “Emerald Necklace” park design by Frederick Law Olmsted Sr. and the 1929 Olmsted Bartholomew Plan. Frederick Law Olmsted Sr. was a pioneer in the field of landscape architecture and is best known for designing New York’s Central Park. 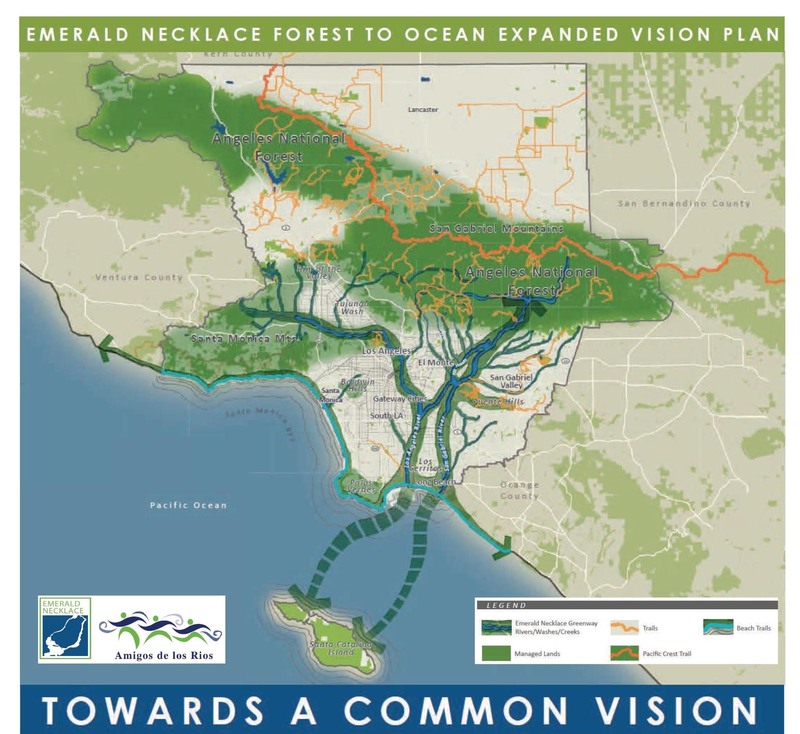 Our vision for a system of parks alongside the Rio Hondo and San Gabriel Rivers is also linked by trails and parkways and truly resembles a necklace inspired the title of Emerald Necklace Vision Plan. Olmsted’s park design can be seen in cities around the United States: Boston, Buffalo, Chicago, Washington D.C. and many others. The Emerald Necklace Vision Plan was inspired by 1929 Olmsted Bartholomew Plan, designed for the Los Angeles area by the Olmsted Brothers – John Charles and Frederick Law Jr., sons of Frederick Law Olmsted. Like their father’s Emerald Necklace design, the plan set out a system of parks and parkways, children’s playgrounds, and public beaches, which incorporated the Los Angeles, Rio Hondo and San Gabriel River watershed areas. The plan was a model of ambitious, intelligent, sensitive planning commissioned at a time when land was available but sadly, due to changing government priorities during the 1930’s depression the plan were never realized.